Cité A Docks Student Housing project located in Le Havre, France. 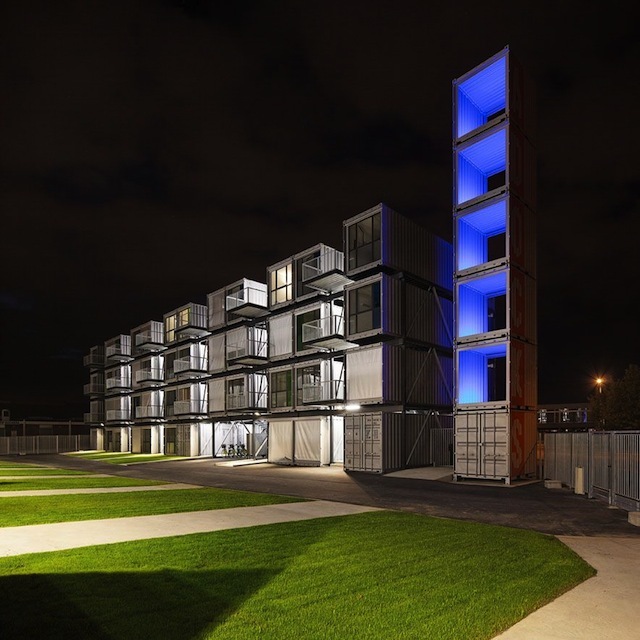 A four-story building that houses 100 apartments made of old shipping containers. 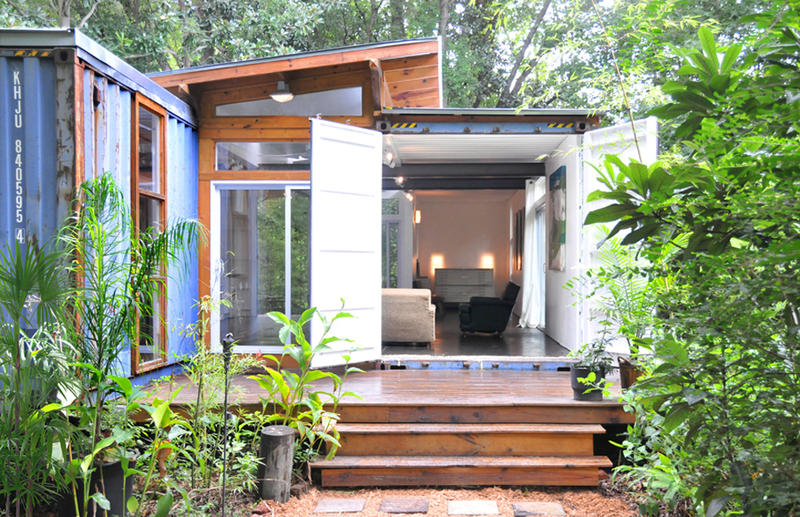 Shipping container architecture is a construction type which uses steel intermodal containers (shipping containers) as the building’s primary structure. Given that there has been a sustained interest in the type, particularly in green building design circles, an objective appraisal seems appropriate. Fundamental considerations include aesthetics, the advantages of this construction type, and the challenges to be overcome if the form is to be viable as an alternative to conventional construction. 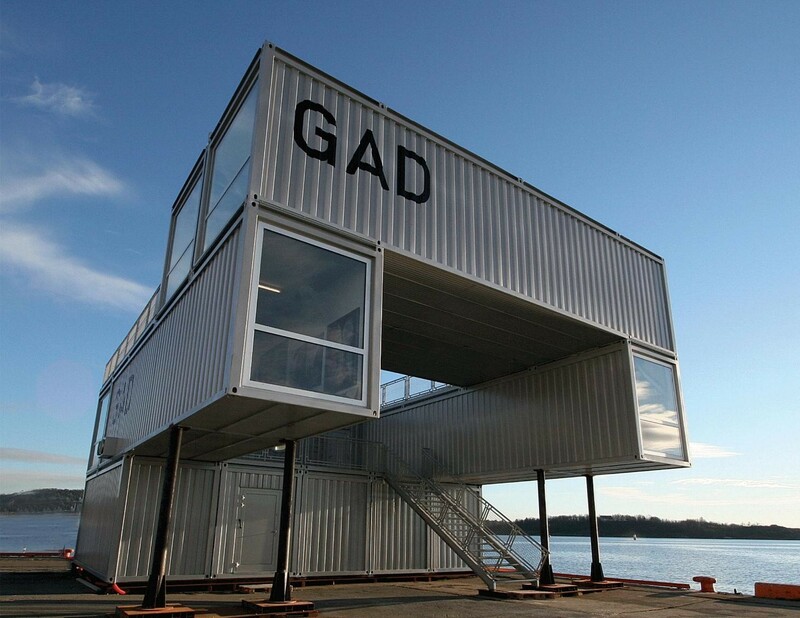 In order for shipping container architecture to be a viable alternative in any given application the first consideration is aesthetics since, obviously, the rough and tumble outward appearance of the building type is not for everyone. That said, given that the type is identified with – and even emblematic of – sustainability as a system of values, the shipping container aesthetic can be seen from that perspective as a strongly positive attribute. 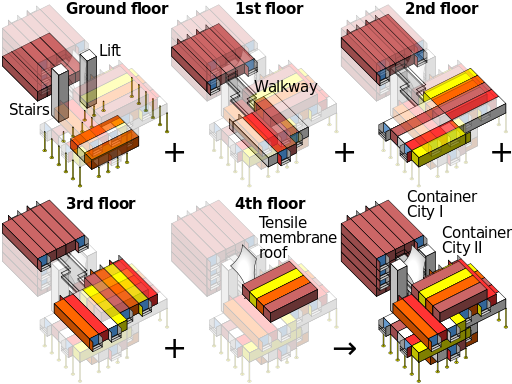 Assembly diagram of Container City, a realized project in the Trinity Buoy Wharf area of London, showing how the unit shipping containers (each nominally 40’x8’x8′) are stacked. More importantly, as the building type becomes more mainstream, the general public’s reception towards the aesthetic can only be destined towards the positive. By way of example, strawbale construction, which only fifteen years ago was widely regarded as the lunatic fringe, is soon to be incorporated into the building codes and has come to be regarded as representing a certain environmentally refined sensibility. Similarly solar panels, decried as unsightly by most city beautiful advocates only ten years ago, have emerged as the default symbols of the eco-chic. This shift towards public appreciation of the aesthetic seems to me just as inevitable, and for exactly the same reasons. 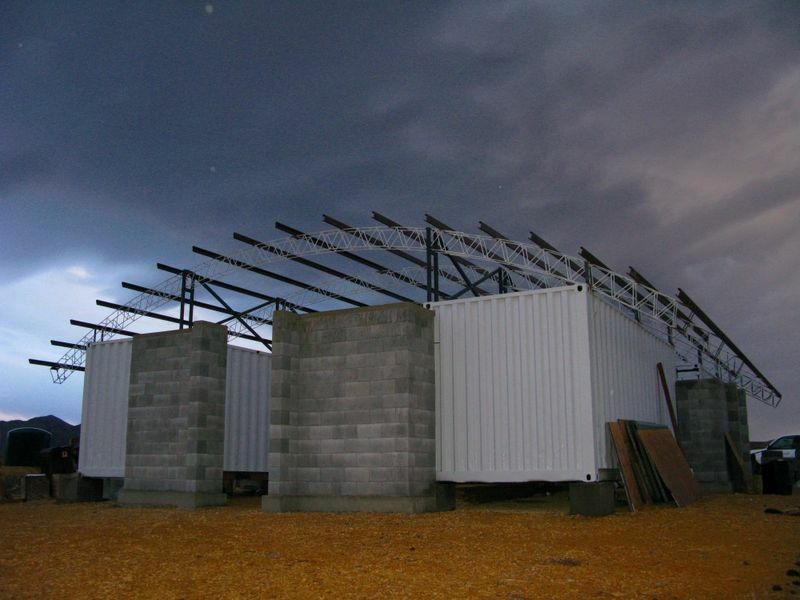 The Southwest Texas Alternative Energy and Sustainable Living Field Laboratory under construction in Alpine, Texas. Adaptive re-use: re-purposing the containers as raw material for construction makes sense from a sustainability perspective inasmuch as these are surplus materials of the shipping industry which would otherwise be melted down for their steel content. A container has 8,000 lb (3,629 kg) of steel which takes 8,000 kWh (28,800 MJ) of energy to melt down, making re-purposing a to-be-desired outcome from both economic and environmental vantage points. Prefabricated: the containers themselves as a building element represent a prefabricated, weathertight, structural shell offering the promise of economical assembly and realization. Strength and durability: Given that they are designed to withstand significant, repetitive dynamic loading, the units are rigid, durable, and structurally robust. Modularized: the inherent modular nature of the units lends itself to an economy of means, both in configurations placed alongside one another horizontally as well as those stacked vertically. It is reported that a stacked configuration can be as many as twelve container units in height. Transportable: as a raw material, given their nature as containers, they are readily transported to all but the least accessible construction sites. Availability: More than 21,000 shipping containers arrive in the United States on a daily basis. Most originate overseas, where it is cheaper to build new containers than to ship them back after their maiden voyages. Reportedly at any given time there are upwards of 700,000 containers are stockpiled on prime waterfronts throughout the U.S. This plentiful supply combined with relatively low demand means that they are prospectively an economical commodity, reportedly costing as little as $900 per container unit. Public low-cost housing project at waterfront location in South Africa. Although there are both intrinsic and tangible upside benefits, the downside constructability challenges bear careful consideration. These include structural integration, introduction of openings, systems integration, waterproofing, and passive solar design challenges. 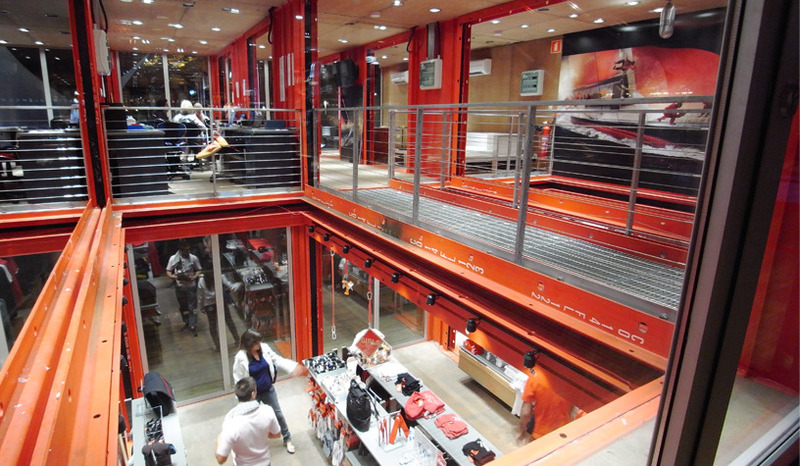 Puma City, an 11,000 square foot transportable retail and event center. The building has been assembled and disassembled a number of times at several different international ports. Although the containers themselves are strong, their interface with the ground should not be overlooked. It’s not a matter of simply locating them in position, leveling them on the raw ground, and calling it “done”. To carry gravity loads sufficient to resist subsidence as well as carry lateral (wind and earthquake) loads requires a code-conforming foundation system. Construction of same, together with a method of attachment to the container which does not comprise weather-tightness, is the first of many factors having the potential to erode their ultra-low cost effectiveness. Introducing door, window, and skylight openings must also be attended to carefully, both in the design and during construction if the final result is not to leak. The addition of these elements, especially combined with the meticulous level of workmanship necessary, can be expected to be amongst the more significant costs in the final budget work-up. Systems integration, the introduction of provisions for plumbing, mechanical heating and/or cooling, and electrical necessities such as power and lighting, is an essential consideration if for no other reason than that every penetration though the compartment shell will need to be carefully attended to for purposes of waterproofing. Although taller containers have an interior height of 9’-6”, standard containers are slightly less than eight (8) feet high, meaning that with forced air systems soffits for ductwork have the potential to become an oppressive feature. Raised floor radiant heating, again because it infringes on floor-to-ceiling height, suffers similar drawbacks. Lafayette Tower, a high-rise live-work tower composed of shipping container housing units within a structural concrete and glass matrix. In terms of waterproofing, although the containers themselves are weathertight, they need to be augmented with a sloped roof assembly in order remain so over the long term. This is because the containers, being meant for stacking, are not designed with upper surfaces sloped to shed water. In the lifetime of the building, unless protected with an exterior roofing element, the upper surface of the metal shell will eventually fail. 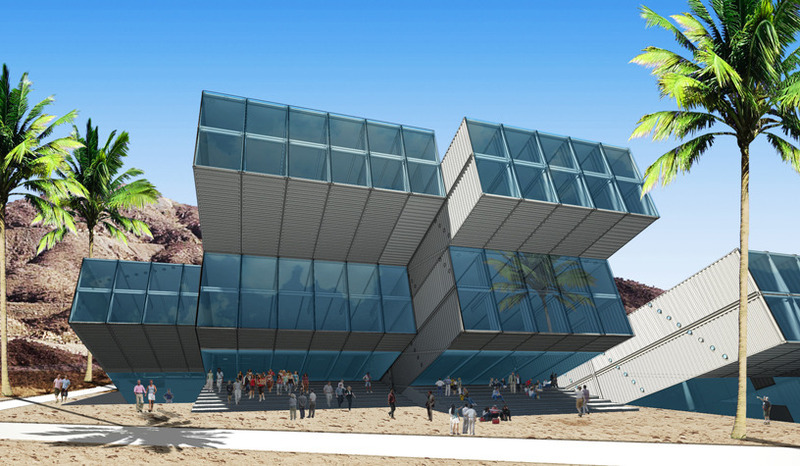 This entry was posted in Santa Cruz Architect and tagged architectural design, building technology, creativity, design process, green building design, net zero energy, Santa Cruz Architect on May 20, 2014 by santacruzarchitect.